Bt is a microbe naturally found in soil. 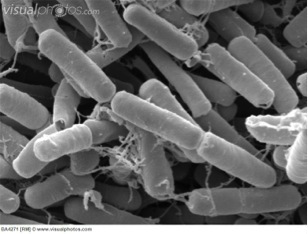 It is a gram-positive, soil-dwelling, spore-forming, rod-shaped bacteria. It makes proteins that are toxic to immature insects (larvae). There are many types of Bt. Each targets different insect groups. Target insects include beetles, mosquitoes, blackflies, caterpillars, and moths. The different types of Bt create toxins that can only be activated by the target insect larvae. In contrast, when people eat the same toxins, the toxins are not activated and no harm occurs. Each type of Bt toxin is highly specific to the target insect. For example, the ‘kurstaki’ type targets caterpillars. The ‘israelensis’ type targets immature flies and mosquitoes. Little to no direct toxicity to non-target insects has been observed. Mode of Action: Bt makes toxins that target insect larvae when eaten. In their gut, the toxins are activated. The activated toxin breaks down their gut, and the insects die of infection and starvation. Death can occur within a few hours or weeks. A Pesticide Information Project of Cooperative Extension Offices of Cornell University, Michigan State University, Oregon State University, and University of California at Davis. Bernstein, L.; Bernstein, J. A.; Miller, M.; Tierzieva, S.; Berstein, D. I.; Lummus, Z.; Selgrade, M. K.; Doerfler, D. L.; Seligy, V. Immune responses in farm workers after exposure to Bacillus thuringiensis pesticides. Environ. Health Persp. 1999, 107, 7, 575-582. Biopesticide Fact Sheet: Bacillus thuringiensis subspecies kurstaki strain M-200; U.S. Environmental Protection Agency, Office of Pesticide Programs, U.S. Government Printing Office: Washington, DC, 1998. Biopesticide Registration Action Document: Bacillus thuringiensis subspecies galleriae strain SDS-502; U.S. Environmental Protection Agency, Office of Prevention, Pesticides and Toxic Substances, Biopesticides and Pollution Prevention Division, U.S. Government Printing Office: Washington, DC, 2013. Viable spores of the microorganism Bacillus thuringiensis Berliner; exemption from the requirement of a tolerance. Code of Federal Regulations, Part 180.1011, Title 40, 2004.